What is the Prognostic Significance of Ki-67 Positivity in Oral Squamous Cell Carcinoma? 3. Department of Oncology, The First Affiliated Hospital of Sun Yat-sen University, Guangzhou, Guangdong 510080, China. BACKGROUD: Numerous studies have stated that Ki-67 is a good prognostic marker in oral squamous cell carcinoma (OSCC). However, some researchers believe the contrary. To address this controversy, we performed a systematic literature retrieval to estimate the prognostic significance of Ki-67 expression in patients with OSCC. METHODS: Databases covering Pubmed, Ovid, Web of Science, Embase and the Cochrane library were searched regardless of publication year. Overall survival (OS), local recurrence (LR) and disease-free survival (DFS) were the main outcome measures. Relative risks (RRs) and its 95% confidential intervals (CIs) were used for statistical analysis. RESULTS: Twenty-seven articles with 2146 patients were included in this study. The results of the meta-analysis suggested that the pooled RRs and its CIs for OS, LR, and DFS were 1.45 (1.15 - 1.84), 1.76 (0.74 - 4.16) and 1.52 (1.07 - 2.14), respectively. However, the heterogeneities of OS and LR were obvious (I-squared (OS) = 59.4%, I-squared (LR) = 72.6%). After subgroup analysis based on systemic treatment, the cut-off value of Ki-67 expression, ethnicity and types of antibody, the heterogeneities became acceptable. It was observed that systemic treatment, cut-off values of Ki-67 expression, ethnicity and the types of antibody affected the results. The statistical analyses of subgroups suggested that non-systemic treatment, (OR=1.77, 95% CI = 1.39-2.25, p = 0.000) and Asian populations (OR=2.09, 95% CI = 1.32-3.32, p = 0.002) are high risks for Ki-67 high expression, and low cut-off value of Ki-67 expression (OR = 1.44, 95% CI = 1.001-2.072), MIB-1 antibody (OR = 1.48, OR 95% = 1.10-1.99) might affect the identification of results. CONCLUSIONS: According to this meta-analysis, high Ki-67 expression might be a negative prognostic marker of patients with OSCC, especially in Asian populations. In addition, Ki-67 expression affects the treatment response. Keywords: Ki-67, Oral squamous cell carcinoma, OSCC, Prognosis, Survival, Meta-analysis. Oral cancer is one of the most common causes of cancer death in many countries. Its functional impairment and high mortality rate give rise to a heavy burden on global public health [1-3]. About ninety percent of malignant oral neoplasms are oral squamous cell carcinoma (OSCC) [4, 5]. Despite major advances in the diagnosis and treatment of OSCC, the 5- and 10-year survival rates remains unsatisfactory [3, 6-8]. Thus, further investigations of risk factors for tumor diagnosis and treatment are highly desirable. Widely accepted conventional prognostic markers, such as lymph nodal status, tumor size, and cell differentiation, are not always well used in the diagnosis and prediction of OSCC [9, 10]. Therefore, investigations of the tumor heterogeneity, including molecular markers, might be useful to explain the mechanism of occurrence and relapse of OSCC. Cell proliferation is considered one of the most important mechanisms in oncogenesis . In 1983, Gerdes and his colleges found that Ki-67 is present in all proliferating cells, but absent in resting cells, which indicated that Ki-67 might be a potential tool for quick estimation of the proportion of proliferating cells in a neoplasm . Subsequently, a large number of studies concerning Ki-67 and the association between Ki-67 and tumors were reported [13-32]. Accordingly, Ki-67 was suggested as a potentially prognostic marker. Although numerous papers reported an associated between Ki-67 and prognosis of OSCC, it has not been used in clinical practice, probably because the association remains uncertain and controversial. Thus, we decided to perform a meta-analysis to estimate and quantify the prognostic role of Ki-67 expression comprehensively in patients with OSCC. A systematic literature search of Pubmed, Ovid, Web of Science, Embase and the Cochrane library databases was performed on Aug 18 2015 to identify all relevant English-language articles without publication year limitations. Four search terms “ki-67”, “mouth”, “neoplasms”, “prognosis” were combined by the Boolean operator “and”, and the search strategies were as follows: (1) marker of proliferation Ki-67 or MKI67 or Ki-67 or MIB-1 or mindbomb E3 ubiquitin protein ligase 1; and (2) mouth or oral or lip or gingiva or buccal or tongue or mouth floor or palate; and (3) neoplasm or tumor or carcinoma or cancer; and (4) prognosis or prognostic or survival. Two authors screened the retrieved papers independently. Irrelevant papers were excluded with reference to their titles and abstracts. The reference lists of all relevant papers were screened to find papers that might have been missed by the original search. (1) When multiple studies from the same research group reported overlapping samples data, the study reporting the most complete dataset was included; (2) meta-analyses, reviews, conference abstracts, non-English language articles, case reports and letters were excluded; (3) lack of key information to calculate the effect size OR, RR and/or HR. All data were extracted independently by three authors (Xie, Liu and Shan). Differences between reviewers were resolved by consultation. The following characteristics were extracted from each included study: first author, publication data, country, no. of patients, cut-off values for estimating Ki-67 positivity, systemic treatment methods, follow-up time, clinical outcomes and other relevant information. If the authors reported OR, RR, HR and their 95% CIs, data were directly extracted from the studies. Otherwise, HR was calculated by the methods reported by Parmar et al. and Tierney et al. OR and RR were calculated using the incidence of events. Kaplan-Meier survival curves were read by Engauge Digitizer version 4.1. We used the Centre for Evidence Based Medicine (CEBM) criteria to evaluate the quality of all included studies [35, 36]. The CEBM included five levels: Level 1, randomized controlled trials (RCTs) or systematic review of inception cohort studies; Level 2, low quality of RCT or inception cohort study; Level 3, cohort study; Level 4, Case-series, poor quality cohort or case-control studies; Level 5, Expert opinion without explicit critical appraisal, or bench research or "first principles". The details of its application were similar to our previous reports [37, 38]. Data analyses were performed using STATA 11.0 software (Stata Co., College Station, TX, USA). The RR with its 95% CI was used as the common effect size to define the association between Ki-67 expression and prognosis of patients with OSCC. The HRs were directly considered as RRs . The OR was transformed into the RR using the following formula: RR = OR / [(1-P0)+(1-OR)], where P0 is on behalf of the incidence of the non-exposed group outcome . To estimate the heterogeneity of the included studies, the Chi-Squared test was used and significance was set at p < 0.05. The inconsistency index, I-squared, was calculated to evaluate the variation caused by heterogeneity. Where p < 0.10 and I-squared > 50%, the random effect model was employed, otherwise, a fixed-effect model was used . Funnel plots were used to detect potential publication bias, with the plots' asymmetry being estimated by Begg's test [42, 43]. Sensitivity analysis was performed to identify the underlying influence of the individual studies on the pooled RR. Eight hundred and one papers were retrieved by the primary search, and 458 papers remained after deleting duplicates. Among them, 349 articles were rejected as being off topic. After more detailed evaluations of the 109 potentially eligible papers, 11 were dropped as being reviews and two were deleted because they contained overlapping data. In additions, five studies were excluded as being conference abstracts or letters. A further 61 articles were excluded because of insufficient data to calculate effect size of OS, LR, or DFS. Finally, 30 articles were included in the study to evaluate the prognostic significance of Ki-67 as a molecular marker in OSCC. Among them, three articles were excluded because of their small sample size (no. of patients < 30). In the remaining 27 articles [13, 22, 24, 25, 27, 28, 30, 32, 44-63], 22 articles involving 23 studies concerned overall survival, six articles with seven studies concerned local recurrence, and four studies were about DFS. A flow diagram of the search is shown in Figure 1. Flow diagram of literature retrieval. Table 1 lists the included studies and their main features. The number of subjects included in these investigations ranged from 49 to 148, and a total of 2146 patients were involved in this meta-analysis. The follow-up period of patients ranged from 1 to 267 months; however, follow-up data for five studies were not available. The cut-off values varied from 10% to 65%. Quality estimation according to CEBM showed that all these studies were level 3 (moderate quality). In addition, 13 of 27 articles were reported Ki-67 expression as a negative prognostic marker for patients with OSCC, and in the 14 remaining articles the association was not significant. Noticeable, two types of antibodies (MIB-1 and Ki-67) were used to detect antigen ki-67. Because MIB-1 can be used on formalin-fixed paraffin-embedded sections, after heat-mediated antigen retrieval, MIB-1 is more widely used than Ki-67. 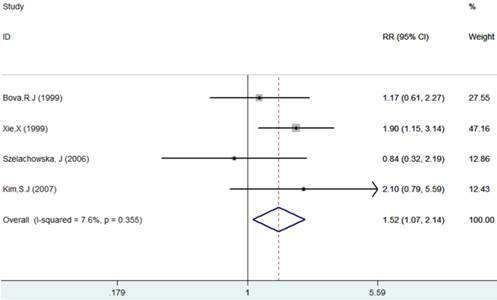 Results of this meta-analysis suggested that worse OS was observed among OSCC patients with high Ki-67 expression (RR=1.45, 95% CI =1.15-1.84, p = 0.002), whereas, the heterogeneity was obvious (I-squared=59.4%, PQ-test=0.000). Thus, we scrutinized all the included studies and found that the included patients came from different ethnicities and underwent the different treatment methods. Some studies only included patients that underwent systemic treatment (surgery, radiotherapy and/or chemotherapy); however, some studies enrolled patients without systemic treatment (only surgery), or partial systemic treatment. Besides, the cut-off value of Ki-67 expression and antibody types were also different among the included studies. Based on these conditions, we performed several subgroup analyses to find the underlying source of heterogeneity. Firstly, a subgroup analysis according to systemic treatment was performed. After this subgroup analysis, the heterogeneity became acceptable (systemic treatment group: I-squared=39.2%, PQ-test=0.160; non systemic treatment group: I-squared=38.8%, PQ-test=0.05). The results revealed that systemic treatment was an important factor in improving the OS of patients with OSCC (RR=0.89, 95% CI = 0.65-1.22, p=0.461). We then performed subgroup analyses based on ethnicity, the cut-off value of Ki-67 expression and the types of antibodies. We found that ethnicity is also an important factor in the OS of patients with OSCC, especially in Asian populations. In addition, the cut-off value of Ki-67 expression and the types of antibodies affect the identification of prognostic significance. The details are shown in Table 2 and Figure 2. 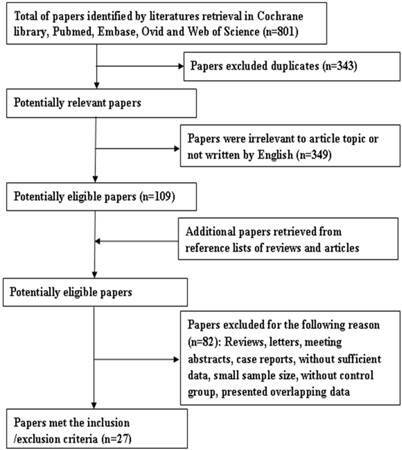 Clinicopathological and Methodological Features of Eligible Studies. ST: systemic treatment; NA: not available; OS: overall survival; LR: local recurrence; DFS: disease-free survival; S: surgery; RT: radiotherapy. ST: systemic treatment; NA: not available or no systemic treatment. Forest plot evaluating the impact of Ki-67 expression on overall survival of patients with OSCC.A: Based on the subgroup of systemic treatment; B: Based on the subgroup of ethnicity; C: Based on the subgroup of cut-off value; D: Based on the subgroup of the types of antibodies. 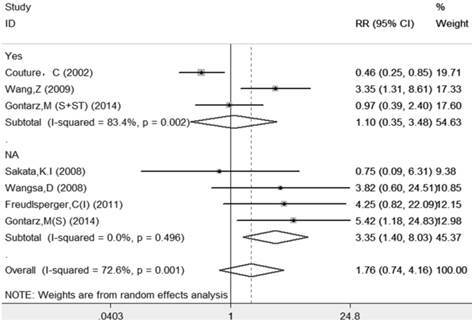 The results of this meta-analysis suggested that there was significant heterogeneity among these included articles (I-squared=72.6%, PQ-test=0.001), and a random-effect model with subgroup analysis based on systemic treatment was performed to combine the RRs and their 95% CIs. 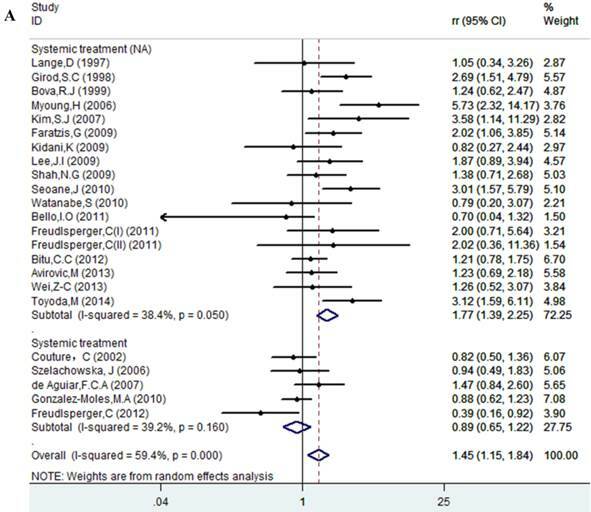 The subgroup analysis also demonstrated that those patients who received systemic treatment (RR=1.10, 95%=0.35-3.48, p=0.874) had less risk than those without systemic treatment (RR=3.35, 95%=1.40-8.03, p=0.007). The sample size for LR was very small; therefore, other subgroups analyses were not performed to avoid overinterpretation. The details are shown in Table 2 and Figure 3. 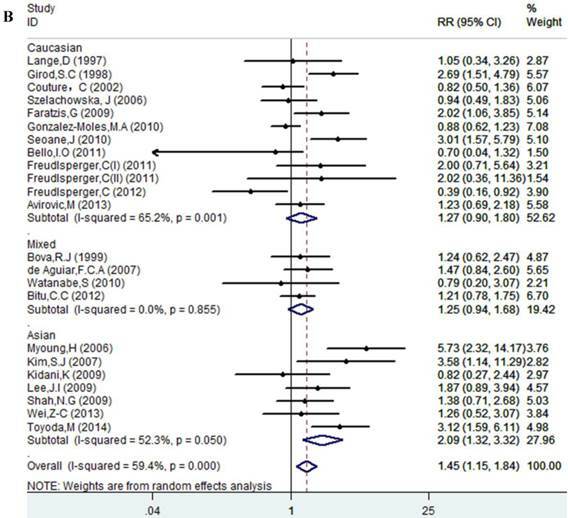 The results of this meta-analysis showed no obvious heterogeneity among the included articles (I-squared=7.6%, PQ-test=0.355), and a fixed-effect model was performed to combine the RRs and their 95% CIs (RR=1.52, 95% CI = 1.07 - 2.04, p= 0.018). The results showed that Ki-67 positivity plays a significantly negative role on the DFS of patients (Table 2, Figure 4). Potential publication bias and sensitivity were evaluated using Begg's funnel plots and sensitivity analysis. Begg's test demonstrated that no significant publication bias existed in this study, and the values of Begg's test for OS, LR and DFS were 0.635, 1.000 and 0.734, respectively (Figure 5). The sensitivity analysis gave rise to variation only between the lower and upper CI limits, suggesting that our study results are robust and credible (Data not shown). Forest plot evaluating the impact of Ki-67 expression on local recurrence of patients with OSCC (based on the subgroup of systemic treatment). Forest plot evaluating the impact of Ki-67 expression on disease-free survival of patients with OSCC. The Ki-67 gene is located on human chromosome 10 (10q25) . In 1993, Schluter and his colleagues reported the complete cDNA sequence encoding the protein . The location and cellular appearance of Ki-67 is dynamic throughout a cell's life [66, 67]. Ki-67 expression is low during G1- and early S-phase, but progressively increases to reach a maximum during mitosis [66, 67]. This indicated that Ki-67 might be applied as a marker for different conditions of cell growth. Cell proliferation is closely related to tumor recurrence. Thus, Ki-67 might be regarded as a potential molecular indicator in the prognosis of a tumor. 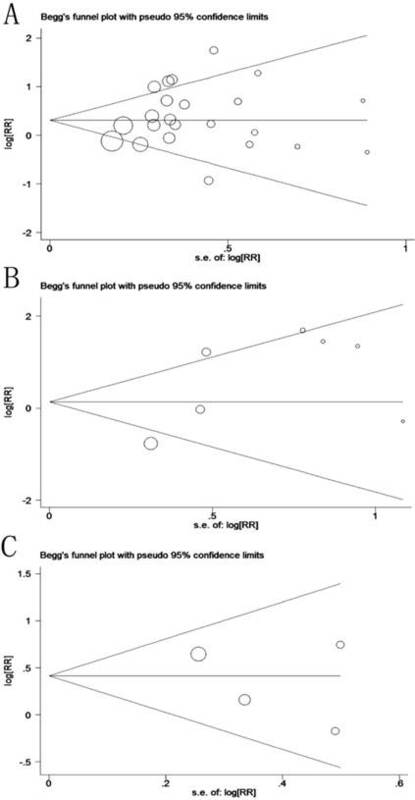 Funnel plot for prognosis of patients with OSCC (A: overall survival, p(Begg's test) = 0.635; B: local recurrence, p(Begg's test) = 1.000; C: disease-free survival, p(Begg's test) = 0.734). Many studies have demonstrated the relevance of Ki-67 to the prognosis of cancers, such as breast cancer, lung cancer and prostate cancer [68-71]. Although the role of Ki-67 in patients with OSCC has been debatable for two decades [24, 32, 61, 72, 73], no study has solved the contradiction convincingly. To explore the contradictory results, we searched published papers and found that more than one hundred articles were involved in this topic. Among these papers, supporters [25, 49, 52] declared that Ki-67 expression is related to the cell proliferative index, which is consistent with tumor progression and recurrence, and dissenters [24, 32, 44] claimed that the proliferative index is unequal to the rate of proliferation. Besides, some authors [13, 30] asserted that Ki-67 expression predicts radiosensitivity in OSCC. However, most of the conclusions were based on small sample sizes and different intervention methods, which might be the source of the controversy. Thus, we carried out a meta-analysis to further estimate and quantify the clinical significance of Ki-67 in patients with OSCC. In this meta-analysis, the results demonstrated that high Ki-67 expression in patients with OSCC results in worse prognosis among patients overall. However, systemic treatment could improve prognosis of patients with high Ki-67 expression. Subgroup analysis of systemic treatment not only decreased the heterogeneities but also confirmed that systemic treatment was an important method to improve the prognosis of patients considered as positive patients, which meant that patients with high Ki-67 expression should be treated systemically. Another subgroup analysis based on ethnicity demonstrated that ethnicity might also affect the prognosis of OSCC patients. The high expression of Ki-67 in Asian populations is also a high risk factor. Besides, the subgroup analyses according to the types of antibodies and the cut-off value suggested that different antibodies and cut-off values might affect the identification of a prognostic role of Ki-67 expression. To estimate the reliability of the results, we performed sensitivity analyses as well as evaluation of publication bias in our study. According to quality evaluation of included studies, our results were supported at level 3 (moderate quality), which could be considered as traditionally trusted. 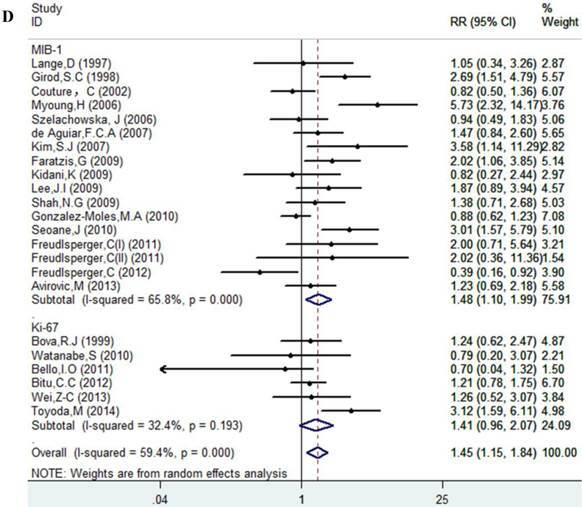 All the results suggested that the results from out meta-analysis are stable and reliable. However, there are still several limitations in this meta-analysis study. First, the use of different antibodies and methods might account for some of the conflicts. In this study, most of the authors assessed Ki-67 expression by the percentage of cells that stained positively for the Ki-67 antigen; however, several researchers estimated Ki-67 expression by the levels of staining intensity. Unfortunately, limited information blocked further exploration. Second, the evaluated HR might be less reliable than those gained from published data. Both the methods of extraction of HR and conversion of OR to RR might produce potential bias. Third, the follow-up time varied from 1 to 267 months, which might reduce the credibility of results. 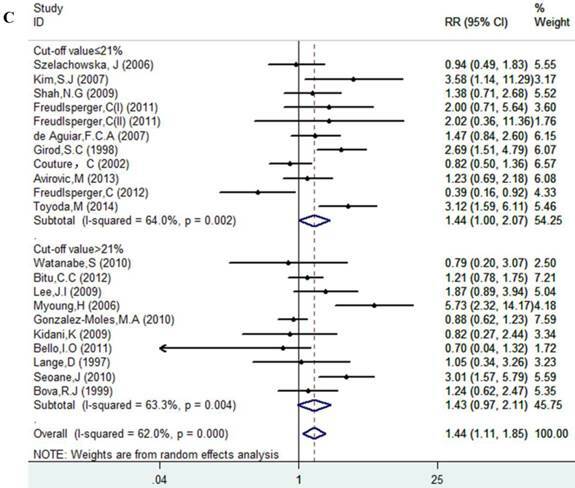 Fourth, the sample size of this meta-analysis remained small, especially the sample size for LR and DFS. Thus, the results should be interpreted with caution. Despite several disadvantages, by quantifying the original data from the included studies, our meta-analysis reaches the conclusion that Ki-67 expression is a poor prognostic marker for patients with OSCC and could promote the response of systemic treatment. If possible, multiparameter studies with the large sample sizes and standard IHC techniques are recommended for further investigations. This work was supported by grants from the National Natural Science Foundation of China (NSFC-81371162, 81100762 and 30973336). The sponsors had no role in study design, data collection and analysis, the preparation of the manuscript, decision to publish, or submit the manuscript for publication. Corresponding authors: should be addressed to Zhi-Gang Cai (Department of Oral and Maxillofacial Surgery, Peking University School and Hospital of Stomatology, Beijing 100081, China. E-mail: c2013xscom; Tel: +86 010 82195956, Fax: +86 010 62173402), or Xiao-Feng Shan (Department of Oral and Maxillofacial Surgery, Peking University School and Hospital of Stomatology, Beijing 100081, China. E-mail: kqsxfnet; Tel: +86 010 82195956, Fax: +86 010 62173402).